Francisco is a high-speed catamaran ferry built by Incat and owned by Buquebus. Image courtesy of Robert Heazlewood. Francisco is touted to be the fastest ferry in the world, capable of sailing at 51.8kt with a deadweight capacity of 450t and 58kt at a lightship speed. Image courtesy of Robert Heazlewood. Francisco is the first dual fuelled high-speed Ro-Ro ferry to operate with liquefied natural gas (LNG) as the primary fuel. Image courtesy of Karyn Hannah. The interior of the Francisco high-speed catamaran ferry. Image courtesy of Eric Graudins. Francisco is equipped with two Wartsila LJX 1720 SR waterjets which are driven by two GE Energy LM2500 gas turbines. Image courtesy of Theo Van Loon. Francisco (formerly Lopez Mena) is the first dual fuelled high-speed Ro-Ro ferry to operate with liquefied natural gas (LNG) as the primary fuel. The high-speed ferry was built by Incat for its operator Buquebus. "The vessel will operate on the River Plate, between Buenos Aires, Argentina, and Montevideo, Uruguay." 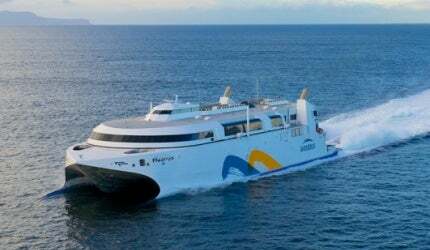 Incat was awarded the construction contract for the catamaran in November 2010. The design works were carried out by Revolution Design. The vessel was constructed at Incat’s Prince of Wales Bay shipyard in Hobart, Tasmania. The vessel was launched in November 2012, with sea trails commencing in March 2013. The energy-efficient vessel was named in June 2013. The vessel carries the 1A1 HSLC R4 Car Ferry B Gas Fuelled E0 class notation. It will operate on the River Plate, between Buenos Aires, Argentina, and Montevideo, Uruguay. Francisco measures 99m in length, 26.94m in width, has a waterline length of 90.54m, draft of 2.98m, and a deadweight capacity of 450t. The catamaran ferry comprises two thin hulls constructed of aluminum. The hulls are connected by a bridging section with the centre bow structure located at the forward end. Each hull is divided into nine vented, watertight compartments divided by transverse bulkheads. Two compartments in each hull accommodate fuel tanks, and an additional compartment acts as a long range tank. Francisco accommodates 1,000 passengers and 150 cars on four tiers. Tier 1 is the vehicle deck providing an area of 4.5m in length and 2.3m in width for each car and an axle load of 2t each. "Francisco is capable of sailing at a speed of 51.8kt with a deadweight capacity of 450t." Tier 2 is subdivided into three areas. The first area is comprised of an economy-class aft lounge with seating areas and a bar, the second area provides a duty-free shop lobby featuring toilet facilities and the third area features a duty-free shop. Tier 3 is subdivided into four areas. The first area comprises a tourist-class aft lounge with seating areas and a bar. The second area features a main foyer with a reception area, business lounges, and toilet facilities. The third area features a business-class mid lounge with seating areas, a bar, and toilet facilities. The fourth area is a first-class forward lounge featuring seating areas, a bar, a VIP lounge, and toilet facilities. The wheelhouse of the vessel is on Tier 4. The fast ferry is also equipped with several reverse cycle heat pump units for air conditioning the rooms in the vessel. Francisco is equipped with two main fuel oil storage tanks with a holding capacity of 70,000l each, two fuel oil generator header tanks with a holding capacity of 1,240l each, two LNG storage tanks with a holding capacity of 40m³ each, a fresh water tank with a holding capacity of 5,000l, and a black and grey water tank with a holding capacity of 5,000l. The vessel is also equipped with storage tanks to store 320l of oily water from the engine room, 1,100l of bilge water, 800l of aft hydraulic oil, and 200l of forward midships hydraulic oil. The vessel is fitted with four marine evacuation stations (MES), with each MES capable of serving up to 256 persons, and nine life-rafts each capable of evacuating 128 persons. The energy-efficient vessel features two Wartsila LJX 1720 SR waterjets which are driven by two GE Energy LM2500 gas turbines. A water jet and gas turbine is fitted into each hull. The waterjets are configured with steering and reverse systems. "Francisco measures 99m in length, 26.94m in width." The GE Energy LM2500 gas turbines were specially designed to burn both LNG or marine distillate (diesel) and are rated at 22MW each. The vessel is further equipped with four Caterpillar C18 generators rated at 340kW each, and two Caterpillar C9 generators rated at 200kW each. A hydraulically operated trim tab is fitted at the aft end of each hull. The vessel also includes three hydraulic power packs with one fitted on the forward and two aft. Francisco is capable of sailing at a speed of 51.8kt with a deadweight capacity of 450t, and 58kt at lightship speed. Hydrogenesis is the first hydrogen-powered boat to operate in the United Kingdom. MV Hallaig is the first hybrid ferry in the world and the first commercial ship to be launched on the River Clyde during the last five years.